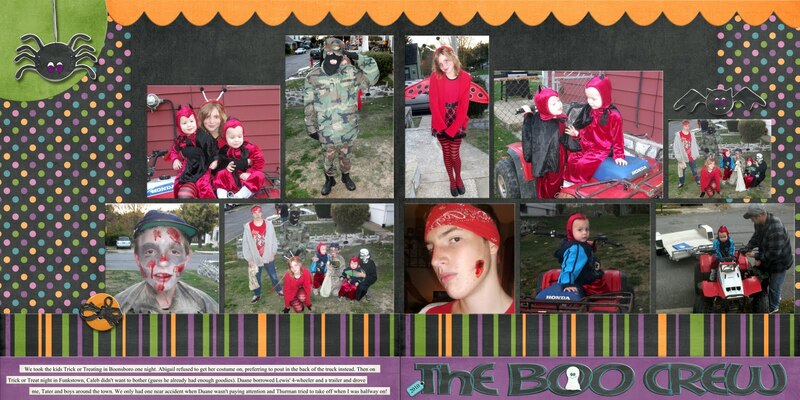 BoomersGirl Designs: Layout: "Boo Crew"
This is the Halloween layout from 2010. Duane borrowed his brother-in-law's 4-wheeler and a trailer and rode me and the boys around in (embarrassing) "style". 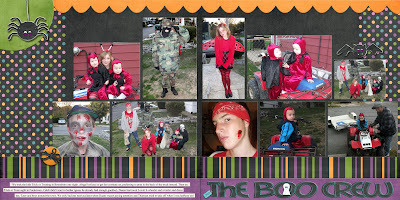 The older kids were too embarrassed and preferred to Trick or Treat without us old people! Digital Kit: "Too Cute to Spook" by Suzy Q Scraps. Awww---cute (Abby), mean and bad (Christian and Caleb). seriously scary (Gabriel) and plaim ornery (Thurman and Logan)---really god job, Lori!